Invented after the 1986 FBI shootout in Miami, the 40 S&W was designed to give the FBI the new round they needed. 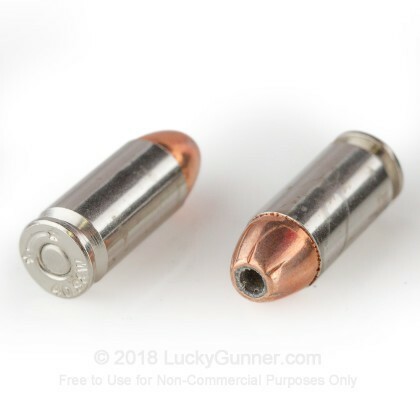 Smith & Wesson succeeded in their purpose, making a new round that has penetration, stopping power, expansion, accuracy, and a manageable recoil, everything you need in a law enforcement round or self defense cartridge. Fiocchi has been around since 1876, and is still owned by the founding family. 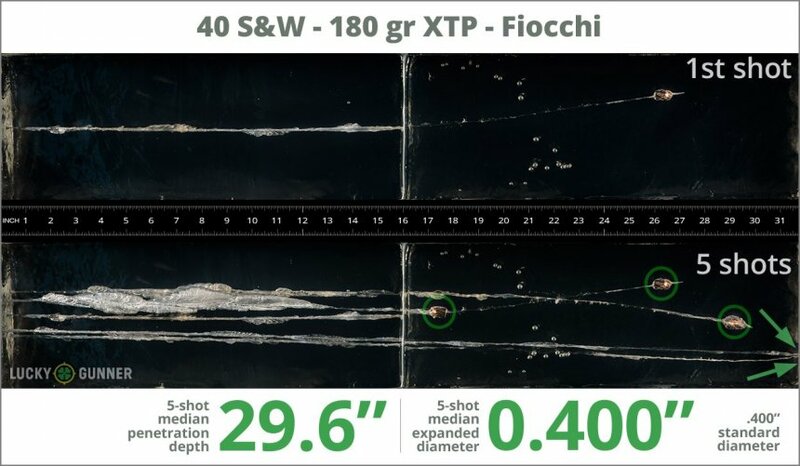 As the oldest ammunition manufacturer in Italy, Fiocchi has gained respect from shooters and hunters worldwide. Fiocchi ammunition is manufactured in both Italy and the USA at their Fiocchi of America division in Ozark, Missouri. Fitted with Hornady XTP bullets, these phenomenal rounds offer some of the best penetration and terminal expansion on the market. 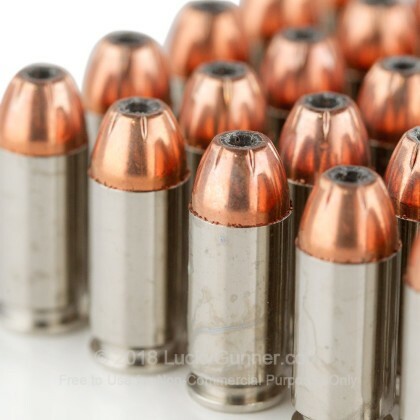 Each round in this case of 500 features a 180 grain XTP projectile this is loaded into a premium boxer primed nickel-plated brass casing. Pick up this case today and rest easy knowing you have the reliability of Fiocchi on your side. As part of our ongoing self-defense ammo testing project, we used Clear Ballistics synthetic gelatin to evaluate the performance of Fiocchi 180 Grain. Five rounds were fired from a Glock 27 into the gel with a four-layer cloth barrier to simulate an attacker wearing heavy clothing. The top image in the photo above shows the first round fired into the gel and the bottom photo displays all five rounds. Below on the left, you can see what the bullets look like after they were recovered from the gel. To the right of that, you’ll find a high-speed video of the first round fired into the gel. 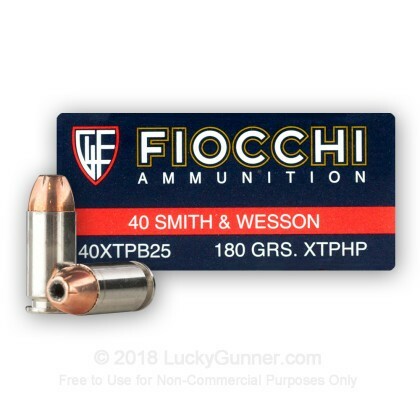 At the bottom of the page, we’ve got a chart with all the data from our Fiocchi 180 Grain test along with a couple of charts that show how this load compared to other .40 S&W (Smith & Wesson) loads. How do the results for this Fiocchi .40 S&W (Smith & Wesson) compare to other 40 S&W Ammo? 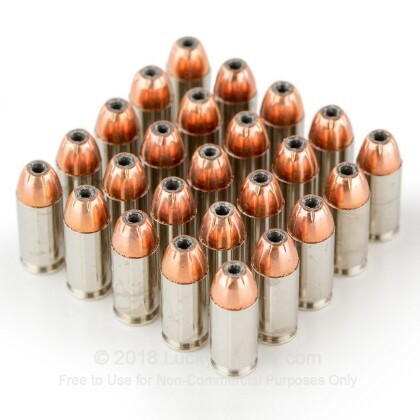 0.89" This ammo: 0.40" Min: 0.39" Median: 0.65" Max: 0.89"
29.6" 0" 9.8" 16.5" 32" This ammo: 29.6" Min: 9.8" Median: 16.5" Max: 32"
We don't have any reviews yet for this particular .40 S&W (Smith & Wesson) ammo from Fiocchi. 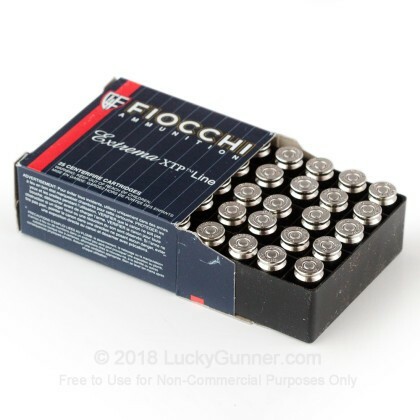 If you'd like to be the first to review this particular .40 S&W (Smith & Wesson) ammo from Fiocchi, fill out the form below. 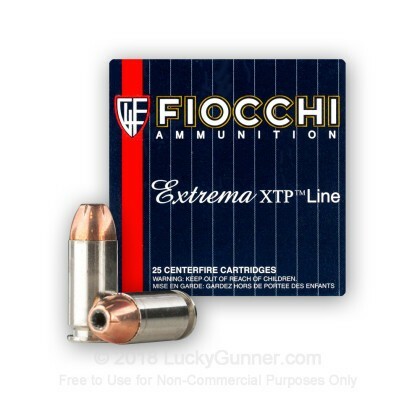 We also have this 40 S&W - 180 Grain XTP JHP - Fiocchi - 25 Rounds ammo in stock in a smaller quantity.